Snug piercing involves the perforation of antihelix, which remains as the innermost ridge of ear cartilage, little above anti-tragus. To get this interesting body piercing, you should have a great inner cartilage ridge.The perfect spot to accentuate some fabulous jewelry piece is the antihelix. Snug piercings can quite much locate anywhere across the vertical inner cartilage ear ridge that runs parallel to the rim that is also known as the anti-helix. It relates close to the rook that locates along upper horizontal place of same ridge. Most of the anti-helix ridges look shallow and only accommodates small snug piercing. A CBR or curved barbell is needed to gather as much cartilage possible inside the piercing and a well trained piercer is required to make a piercing that does not present undue stress on both the sides of the ridge. Improper balance could lead to irreversible damage in the cartilage. Based on the thickness and depth of anti-helix, you can wish for as small as twenty gauge for your snug and in many cases, anything more than a 16 gauge is not recommended. The size of the captive bead ring or length of barbell must be determines by the piercing artist to make sure proper placement as well as balance. High-quality curved barbells should be worn during the initial stage of healing. 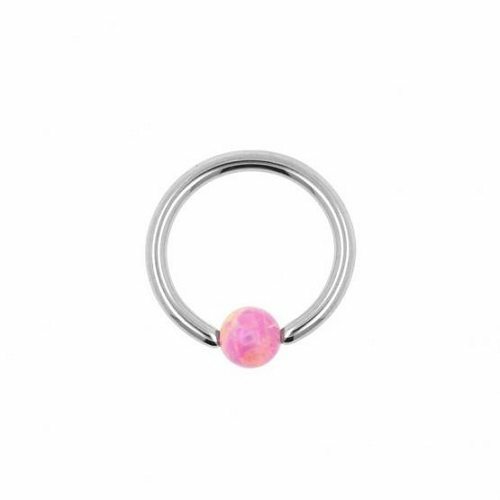 Snug piercing matches well with ball closure rings available in a range of designs and colors. Stud earrings are typically not suggested for this piercing because of its odd location. 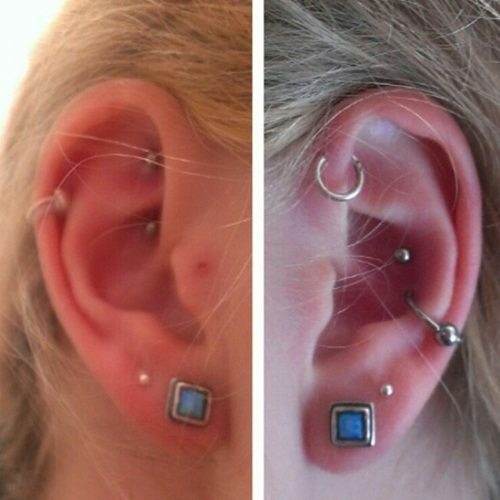 Two variations of snug piercing are possible, which include double snug piercing and faux snug piercing. Two piercings are made on the antihelix. But, the time to heal might be extended for this kind of piercing. 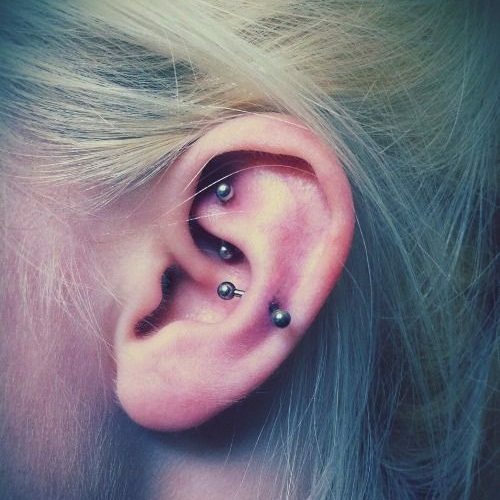 Faux snug piercing is a blend of lower helix piercing and outer conch piercing. 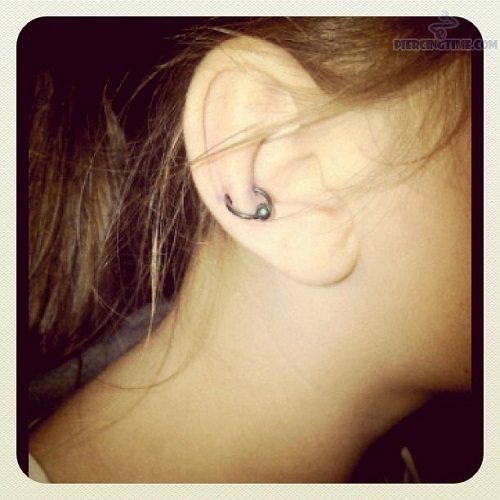 When you don’t have well grown anti-helix for ordinary snug piercing, you can choose this one. When it comes to snug piercing, it is necessary to consider that the piercing and jewelry will in contact or trapped with hair, bedding and clothes during as well as after healing. Hence, the jewelry has to be simple that must be without edges or points that would get caught with things but yet offers room for swelling, cleaning and discharge. As the jewelry tends to suspend, it is important particularly during the process of healing that there no extra weight which might bring stress on the piercing while healing. Curved barbells for snug piercing are considered as more versatile with the placement. Unlike a circular or ring jewelry style, the piercing is placed further apart from the edge of ear without increasing the profile and width of the jewelry. As the jewelry is threaded it can be removed easily when needed. 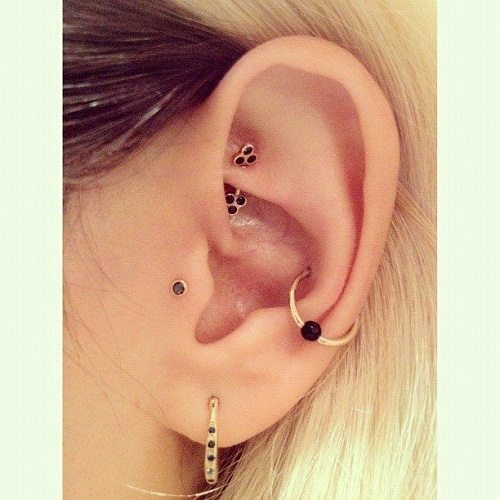 These jewelry styles for snug piercing have no sharp points and edges. Since these styles of jewelry are not wider and tight than piercing area, it allows additional room for cleaning. Particularly, with beaded and captive bead, the jewelry is crafted to secure wear for long term and also there is no need to bother about ends getting unscrewed. Made out of great quality durable materials, this product has been tried as well as tested to make sure that it withstands scratch and other possible damages. This unique of jewelry is perfect as a gift for treating someone very special in your life. 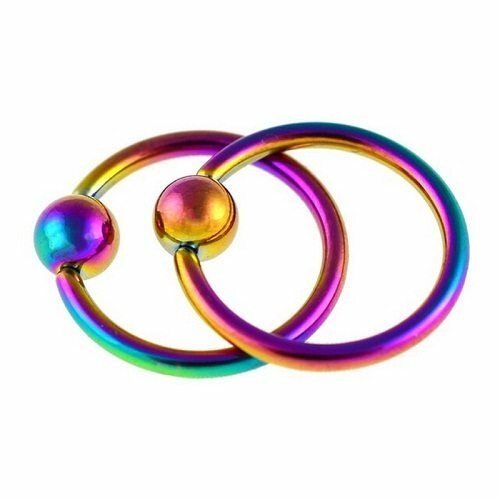 This exquisite circular barbell is perfect for most piercing types including cartilage, ear, and eyebrow, lip and belly piercings apart from snug piercing. The cute rose charm is produced from high quality 925 sterling silver and measures 5mm. The barbell featured on the circular is made out of 316L surgical grade stainless steel to ensure safety. 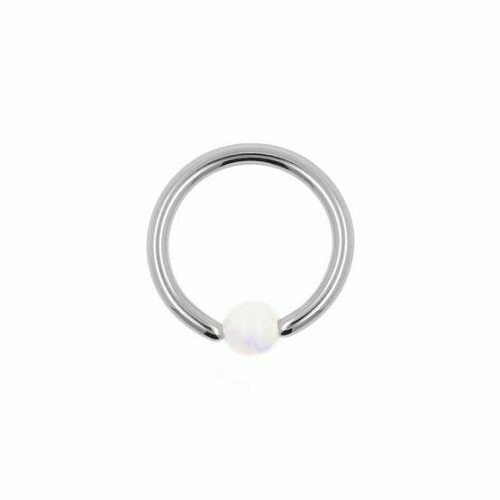 This wonderful barbell is perfect for most of the piercing types including snug piercing. It is featured with shiny black cubic zirconia charm and is also prong set by means of quality 925 sterling silver. Barbell on the circular is crafted from 316L surgical grade stainless to assure skin protection. 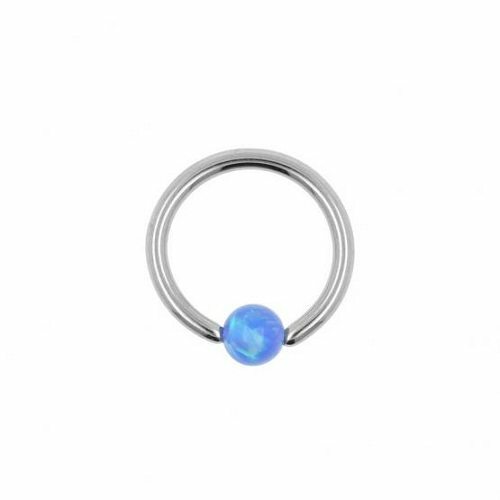 With this fabulous piece of titanium blue circular barbell, you can able to attain that desired effect with body modification soon after it is made. It is because titanium is the specific material easily allowed in a body area that is freshly pierced and fortunately for you, this titanium barbell is made on it. This barbell is circular that is considered as a suitable option for different piercings particularly the septum and it is also much easier to wear in than other barbells. This circular barbell measures 1.6mm and also 10mm in length, but still sits in the pierced area perfectly without causing any kind of discomfort. Titanium excellently prevents infections as it is finished in an easy to clean manner. This plasma gold curved barbell features PVD coating on implant grade titanium that makes it perfect for initial piercing and also healed piercings. This curved barbell is intended for piercings, where a ring might be disruptive and a straight bar might lead to discomfort. You can sport this curved barbell for different piercings, including eyebrow, navel and particular ear and lip areas. If you are searching for eye-catching yet versatile jewelry, then have a look at this piece of polished titanium BCR measuring 1.2mm. This BCR is considered as ultimate in individual design perfect to wear for distinct kinds of piercings. Ball closure rings are highly secured as well as durable, which makes them a better option for someone why puts their jewelry regularly. This glistening silver ball closure ring is made out of implant grade and it is naturally biocompatible titanium that forms a suitable option for anyone who experienced allergic reaction to other kinds of jewelry.